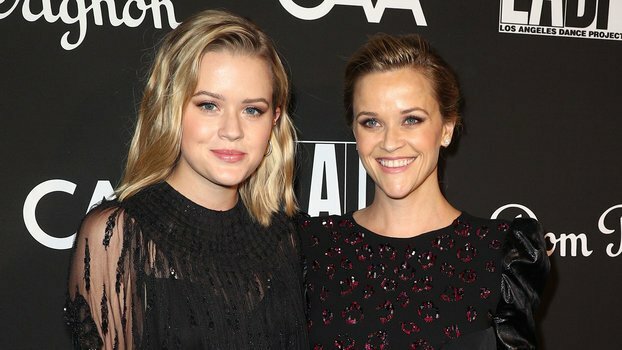 I gotta say it: Reese Witherspoon isn’t a regular mom, she’s a damn cool mom and the proof is in her daughter Ava Phillippe’s new hair color. When I was in high school, I died to be allowed to experiment with my hair color, and I begged my mom to let me, to no avail. My younger sister had it much easier because our mom let her add a few peek-a-boo fuchsia and orange low-lights to her dirty blonde hair. Today, I’m perfectly content with my dark brown hair, so I don’t get the urge to experiment with my hair color like I did when I was a teenager. However, that doesn’t stop me from being totally, completely, utterly jealous of Phillippe’s rainbow hair color. The very cool teen debuted her new technicolor pastel streaks on Instagram. Perhaps Phillippe is getting ready to attend her first Coachella, or maybe she was inspired by her peers like Maisie Williams, who has embraced rainbow hair. Either way, spring is a great time to try a more colorful look. The mother-daughter duo, who often attend red carpet events together, are often called twins. But, with Phillippe’s hair like this, she’s almost unrecognizable from her celebrity mom. Witherspoon is loyal to being a blonde, and typically only experiments with her hair color if it’s for a role, like when she played brunette June Carter Cash in Walk The Line. The bottom line: Being adventurous with your hair color doesn’t always run in the family.